Larry A. Ashman, 65, of Hudson, Massachusetts, went home to be with Jesus and his beloved wife Regina M. (Brown) on Friday, March 29, 2019 after an extended illness. Larry was born on July 7, 1953 in Framingham, MA to Donald B. Ashman (deceased) and Claire A. Ashman. Larry graduated from Nashoba Regional High School, and shortly after he married the girl he had loved since they were 10 years old, Regina, on October 30, 1971 in Stow, MA. They made their home in Massachusetts until 2000, when they moved to Margaretville, NY to be near their grand-babies and enjoy the mountains. Larry moved back to Hudson, MA in September 2016 to live with his daughter Katie Ashman and her children, Jason Coffin Jr. and Victoria Coffin. Larry was a master carpenter and contractor for over 30 years, building beautiful homes in Massachusetts with fine details. While in New York, Larry was a member of Catskill Mountain Christian Center and belonged to the Margaretville Fire Department and Fire Police. Larry loved his family and his grandchildren, and was known as a ‘baby magnet’ – children loved him. He loved playing horseshoes, golf, cards and Werther’s candies. He loved the mountains, and visited the White Mountains in New Hampshire often with his youngest brother, Mark S. Ashman. Larry is survived by his devoted mother, Claire A. (Daigneault) Ashman, his two daughters, Jessica (and Paul) Moore and Kathryn Ashman, and six grandchildren: Alexander, Luke, Will and Carley Moore and Jason Jr. and Victoria Coffin. He is also survived by his brothers and sisters: Donald B. (Claire) Ashman Jr. of Diamond Bar, CA, Janet Kettle of Hudson, MA, Kaye (Joe) Cacciatore, Rob (Pam) Ashman of Lancaster, MA, Laurie (Jim) Marcheterre of Hudson, MA, David (Carole) Ashman of Hudson, MA, Chris (Jeanne) Ashman of Powhatan, VA, Steve Ashman of Northboro, MA, Joanne (Jerry) Webb of Clinton, MA and Mark (Karin) Ashman of Hudson, MA and his brother-in-law Chet Jacobs of Stow, MA. Larry also leaves behind 29 nieces and nephews, 23 great-nieces and nephews, and countless friends – all of whom he loved very much. Larry was predeceased by his father, Donald B. Ashman, his great-grandmother Pearl Osborne, his brother, Rick Ashman and his beloved wife, Regina M. Ashman. 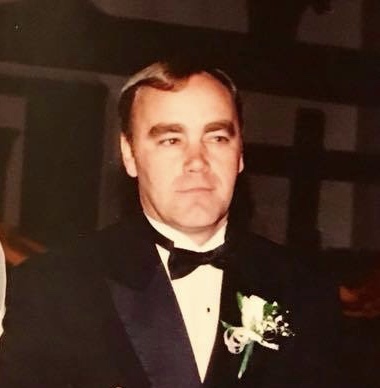 The funeral mass will be held on Monday, April 1, 2019 at St. Michael’s Parish, 21 Manning St., Hudson, MA, at 9:00 AM, coordinated by Tighe-Hamilton Funeral Home. Burial will be coordinated by Hynes Funeral Home in Margaretville, NY at a later date. Donations in lieu of flowers may be made in Larry’s name to The Family Table Community Assistance Program, PO Box 26, Margaretville NY, 12455 or online at www.cmcconline.org.